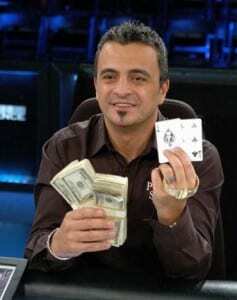 Professional Poker player Joe Hachem is best know for his big win in the World Series Of Poker (WSOP) in 2005. Mr. Hachem walked away from the main event with seven million five hundred thousand dollars which at that time was the largest win at the WSOP. Poker Champion Joe Hachem has ten golden rules that he follows which can be found on his website. My personal favorite is to keeping your records accurate if you truly want to mange your funds honestly and truly. I will cover his Golden Rules later on but Mr. Hachem goes on say not to fool yourself and do not cut corners. He believes that a poker player should manage himself or herself intelligently as an accountant would. He proved that this works like a charm when he won his first World Poker Title in 2006 at the Bellagio Five Diamonds Poker Classic. He walked away with over two million dollars. Mr. Hachem made a reputation for himself that year in 2006 because he was one of the only 5 poker players to win both the WSOP and the Bellagio Five Diamonds Poker Classic. That is not all, in 2009 he won over ten million dollars in a live tournament which made him at that time the fifth ranked player in live tournament career earnings. Mr. Hachem was born in Lebanon when he was six years old his family moved to Australia. After working as a chiropractor for over ten years he gave up his career due to a very rare blood disorder. In the mid 1990’s Mr. Hachem began to play poker online and at land based casinos. Mr. Hachem had to learn to control his temper in the 90’s in order to move up the rankings and become a champion. Mr. Hachem has ten Golden Rules which when a poker player or gambler follows; they are usually successful. His first rule is to play within your bankroll. Most people think this is easy to do but it is not. The concept is easy to understand but in a poker game it is easy to get in over your head. He stated that a poker player or a gambler must feel comfortable with the money that they could loose. Mr. Hachem’s second rule is that he feels the size a poker player or gambler’s bankroll should be proportionate to the size of the poker game. This is an easy concept; if you don’t have the money to loose sit the game out. The third rule Mr. Hachem has is that scared money never wins. I really like this rule because it is true for all facets in life. A poker play, gambler, or anyone should not live in a fear-based reality. If a poker player plays scared then he will seldom win. Fear can destroy a poker players thought process. Mr. Hachem has many rules and I am going to move on to his fifth golden rule. Unless the stress of the game makes you stronger, it will end up making you miserable. This goes against the saying whatever doesn’t kill you makes a person stronger, which I like. This is a much more strategic mindset; Mr. Hachem has more golden rules on his website. Lets Take a look at one of his big wins on this youtube video.